A bit of Art for the weekend.. This year, at the Venice Biennale, Swiss artist Julian Charriere and German-born Julius von Bismarck, who was the first artist in residence at CERN, executed a project called (in a nod to Orwell) "Some Pigeons Are More Equal Than Others" whereby they spray-painted pigeons and released them in the city. The pigeons were made-over using a conveyor belt-like mechanism that the artists first tested on a rooftop in Copenhagen. 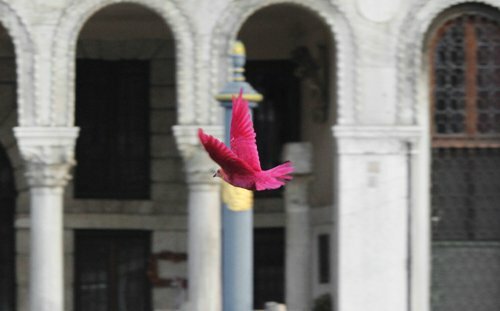 Turquoise, fuchsia, and other intense tones were spotted around St. Mark’s Square this week, replacing the familiar gray coloration of these well-known residents of Venice and cities everywhere. Charriere told Italian newspaper Corriere della Sera that the spray-painting was employed "without any danger to the animals." Maybe so, but though undeniably interesting, the exhibit walks an uneasy ethical line.. What do you think ? For my taste, pigeons never looked better ! No more rats of the sky ! Loved it !